"I'm as proud of this as anything I've ever done in my life." I haven't met him before, but I know his films, Pleasantville and Seabiscuit. Now he's at the head of a new franchise, a new adventure in filmmaking. Gary Ross is the director of The Hunger Games, and he co-wrote the screenplay with Suzanne Collins, the author of the books this is based on. I've already seen the movie twice and I love it, it's a fantastic slice of post-apocalyptic sci-fi with gritty worlds and robust characters. A few weeks ago, I was invited to sit down with Gary for an interview on Hunger Games, to discuss any and everything about bringing this story to life. To start, what really intrigued you about this story to the point where you thought, "I have to direct this and I have to get involved?" Gary Ross: Two things. One, it had a really broad canvas, which any director would salivate at. It's world building. It had enormous technical challenges. The canvas on it was huge. But at the same time, it's an intimate character story and it's something that I was really, really drawn to. And Jenn's arc, how she goes from someone who's just a survivor to someone who's willing to die rather than take an innocent human life. I mean that's a wonderful, graceful character arc that, you know… And in the hands of Jenn Lawrence, that's a phenomenal thing. So yeah, I was thrilled to do it. Did you see the potential for what it could become, in terms of a screen franchise, when you were first reading it? Gary: Well, you know, I only read the first book at first, when I jumped in. Then a while after that I read "Catching Fire". "Mockingjay" wasn't even out yet. So this was all… it was really just "The Hunger Games" that I responded to at first. Going off of the book, how exactly you break down the book, and determine the balance of what to keep, what to change, and what to really focus on for the cinematic version? Gary: Well, I mean it's pretty faithful. It's a pretty faithful adaptation. So the essence of this thing I thought was her relationship with Peeta, and the arc and the through-line of that, and Suzanne [Collins] felt the same way. Obviously, all the major elements that were in the book were in the movie, and we were faithful to that. Look, I wouldn't have gone in to this if I wanted to depart from it. I mean, what I liked was the book. I mean, yeah, there's a craft in adaptation where you have to find the essence of something and distill it down for reasonable narrative. But that's my job. What I loved about Suzanne's statement once she saw it was what she was saying about how she recognized that film is a different medium than a book. Gary: She really does, I gotta say. And when we're working together, she did too. I mean, look, we did the last draft of the screenplay together. And Suzanne is all good about understanding that some things work in a book, some things work in a screenplay. Plus, she has a ton of fun making up new stuff for the movie. I mean, that's the thing most people don't realize: "Oh, you know, the author is not going to want to do this." But Suzanne and I had a blast coming up with new stuff. I mean, she loves that because, she's already written the other stuff. So the idea that we can sit in a room and pitch and come up with new things, I mean that's a ball for her. I mean the inclusion of Seneca Crane is not even a character, and he becomes kind of an antagonist. I mean that's a pretty major creation. And also, how I discovered his relationship with Snow, and the subtext of which is there's a younger generation who only wants the games to play as television, and there's an older generation that understands that these games are actually an instrument of political control. It's like, there's a newer generation who has forgotten the intention of this. That's what those scenes with Snow are, that Seneca has wondered away from this and has forgotten what the intentions actually were. So it's interesting. It is. And it's good to see that in there, because I think it adds to being able to watch it in this way and see the franchise that it can become. Again, balancing how much you break down from the book, how much did you want to approach the sci-fi elements? Because I'm a sci-fi nut and that's sort of what I gravitated to. Gary: Tell me what it is that you… tell me what you dug about the sci-fi. When you say sci-fi, what do you mean and what it is that enthralled you? Well, I would say sort of the bleak look at the future and the societal divisions and that there can be… the almost typical story of the one person who can cause a difference in the way society is at that point. Gary: And that is a kind of a convention of the genre, what you are saying, a little bit. Interesting. Like the Muad'Dib in Dune or whatever. Gary: Yeah, I totally understand. No, I get that completely. I think that's what's interesting in this - is that Katniss evolves as a human being and her empathy and her moral center. I mean, if you look at Dune, for example, it's the birth of this guy. And the great thing is is that they know he's the Muad'Dib before he knows he's the Muad'Dib, right? So it's a similar thing in Katniss. It's not that she's chosen, but we see an inevitability of this by her consummate skills, who she is, fiercely protecting her sister. She's almost destined on a path where she's going to discover certain things that are going to lead her into this position. But it's only in finding her own empathy, her sense of caring, her compassion, first caring about Rue, the way she cared about her sister, and that opens her up to learn to trust Peeta, where she previously mistrusted him; she had the instincts of a hunter. And now, suddenly, she is more open in that regard. And it's those things. And then refuses to take his life because of it, right? It's those things that lead her to the defiant act, which is that lone individual who is willing to draw the line and say, "No, I won't." And it's that act of ethical defiance once she finds her own moral center that allows her to do something which could actually incite a revolution. We talked, I think last night, about the Air of Spring; you know, one Tunisian fruit vendor. So I mean this is actually true in life; this is not just true in the movies. But I see what you mean genre wise- there's sort of a classicism to that, yeah. Yeah. So then how do you find a person to play that kind of depth in the character…? Gary: Well, I was worried before I met Jenn. I mean, you know, it's like - I love the script that we did. I love the story. I was really excited about directing it. But, God I hope I can find Katniss, and Peeta. I mean those were the two things… Like, I know I'll find everybody else, but that's scary. And then, thank God Jennifer Lawrence existed. I saw her work and then I met with her, and that was a great meeting. And then when she auditioned for me, she knocked my socks off. And I just breathed a enormous sigh of relief, because without her I'm just screwed. You know, I really am. I don't know what I would have done without that girl. 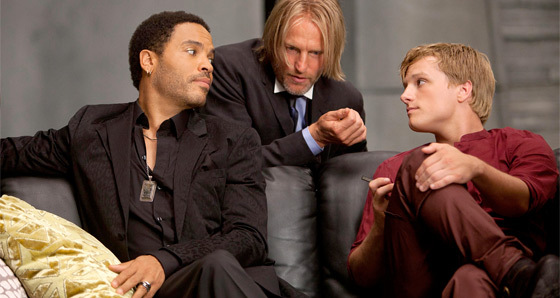 Well, I would also say the same for Peeta, but I was going to mention Cinna as well - Lenny Kravitz. From what I had read in the book, I had pictured different, but then in thinking about it, I was like, "You know what? This is perfect." I mean because he is such an important character to the story. Gary: Yeah, he totally is. And he needs to have that sort of importance in the film as well. And I think Lenny Kravitz brings it to him. Gary: Yeah, totally. Well, you know, if you are an artist in the capital, this is what you become. I think where you might be a rock star in another culture, you be end up being a stylist in that culture, because that's what they are. But Lenny had also shown a great kind of nurturing side in Precious, and there was a gentle quality to him and a caring quality. I thought he had both. He had that kind of bold hipness, and at the same time there was a sensitive, compassionate side to him. And all those things were so interesting in one person. Yeah. I'm glad it all came out. I loved seeing him in the film. I think he played it so well. Gary: Oh, I'm glad. I'm glad. Yeah, he's terrific. We talked about this briefly before, but it felt like some elements were added to setup a franchise. Gary: Yeah, well it's obvious there's another book, and it's obvious that the antagonist is between Katniss and Snow, and it's obvious that this is going to continue. So that was something I wanted to explore. And I wanted to set that up for the next time. And the scenes with Snow are really about context for this movie, not for the next movie. Because we need to see and understand the capital, the nuances of the capital, and the differences between Seneca and Snow. You need to feel the machinations of those things going on. But also, ending on Snow and his concern about what Katniss is becoming, I mean, obviously, that's stuff that is out of the next book. Well I was going to say, I loved how it ended in the book and I loved how it ended in the movie, too. I'm glad you kept that. Gary: Yeah, that there's an ambiguity and a kind of neutrality, that we aren't like ramping up towards some victorious conclusion. I'm not interested in that. In the same way that we never yank you through the movie manipulatively. We let you experience the movie naturalistically. And I thought it was really important after the games were over to kind of reestablish that feeling of neutrality where you just lean forward and like, "What the hell is going to happen now?" And it's very hard to maintain neutrality at the ending and just let this thing unveil in a way that it has ambiguity and uncertainty. Thank goodness that's what Suzanne wrote. It worked, you know? Are you invested in this to the point now where you feel like you have to make the sequels? Gary: Listen. I'm attached to the next one. It's my intention to do it. I haven't really had a chance to think about it. I mean, literally, the cake came out of the oven two days ago, so I'm like a little… you know, I'm a little at the point where I plan to think about it and engage in it, but that's… I'm not at that point yet… That's around the corner. The last question: if you had to give one reason to people who haven't read the book and who aren't inherently interested, the reason to come see this, what would it be? Gary: Oh… I think it's a really emotionally engaging movie that has a lot on its mind. I think you are going to be stimulated, thrilled, scared, moved—all those things. But I also think you are going to be challenged. I think it's thought provoking at the same time that it's everything else. I think that it has a lot on its mind. It's not an empty piece of entertainment. It's fantastic entertainment, but it's not an empty piece of entertainment. This isn't sugar water. These aren't empty calories. And I think it's emotionally engaging for the right reasons. And I think we have phenomenal performances. No, I'm as proud of this as anything I've ever done in my life. Excellent to hear. Thank you to Gary Ross and Lionsgate for this interview. 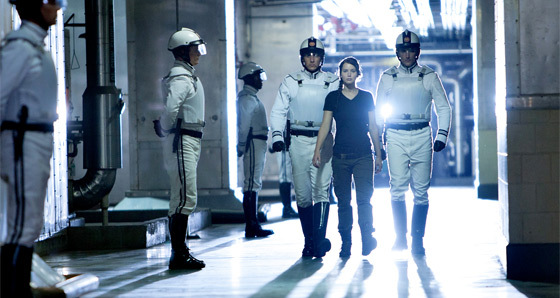 I really enjoyed The Hunger Games and highly recommend seeing it, once it arrives in theaters this weekend! Fantastic interview, as always. I really like your style and approach to interviews, they're always really dynamic and different from all the others. Great work, Alex. It was a fantastic film. I hope the sequel is even better.